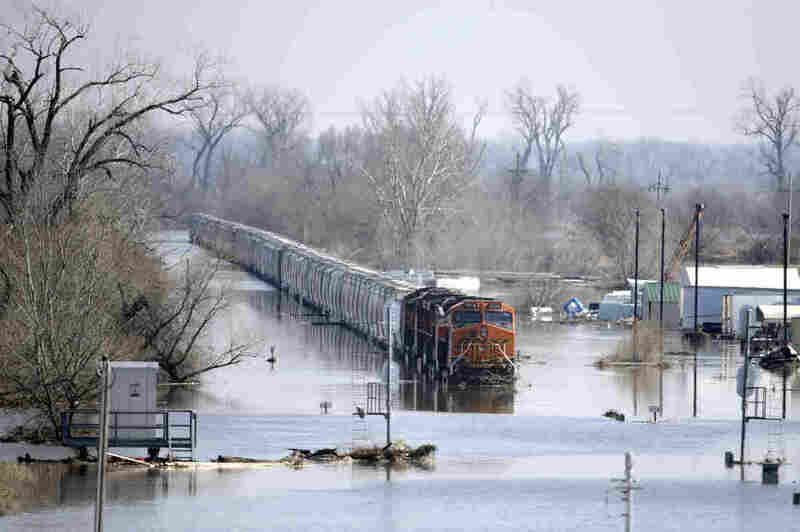 A BNSF train sits in floodwaters from the Platte River in Plattsmouth, Neb., on Sunday. Hundreds of people remained out of their homes in Nebraska as rivers began to recede. In parts of the Midwest, floodwaters are starting to abate. But elsewhere, they’re still rising. In Iowa and Nebraska, hundreds of homes are flooded. There are lakes where fields and roads should be. Local police departments are sending out motorboats instead of squad cars. Hornick, Iowa, resident Dale Ronfeldt’s basement is flooded with 4 feet of water, Iowa Public Radio reports. “My washer and dryer are floating around down there somewhere,” Ronfeldt said. A flood warning is in effect through Tuesday morning for counties in southwestern Iowa and eastern Nebraska. In Missouri’s Holt County, homes have taken on 6 or 7 feet of water. The flooding followed an intense winter storm known as a “bomb cyclone” of wind and rain late last week. Two deaths have been attributed to the flooding, and two men are missing, according to The Associated Press. Camp Ashland, a National Guard facility in Ashland, Neb., was flooded on Sunday. For communities along the Missouri River, spring floods are no surprise, but their frequency hasn’t made them easier to manage. 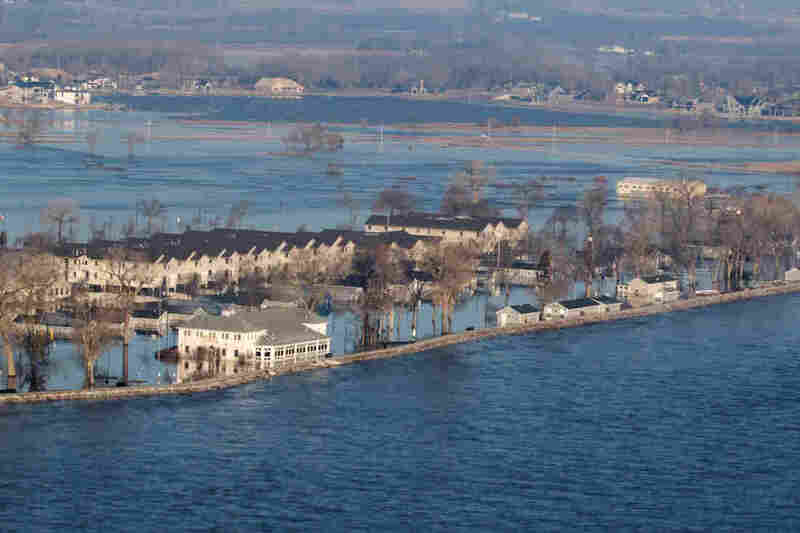 In Nebraska, the floodwaters inundated two military facilities, Offutt Air Force Base and the Nebraska National Guard’s Camp Ashland. After a major flood in 2015 that was characterized as a once-in-a-thousand-years event, the National Guard installed new floodgates at Camp Ashland, according to the Omaha World-Herald. But the apparatus apparently didn’t work so well against this flood: The water was reportedly 5 feet high inside one of the site’s buildings.